From the time our children are babies, we seem to naturally draw their attention to environmental sounds, and in turn, begin to develop their auditory processing skills. Early activities and games, where your child learns to identify and recall sounds, includes things like making and identifying the sounds of specific animals, putting on a dramatic presentation, singing, recalling a rhyme, and dancing to music! 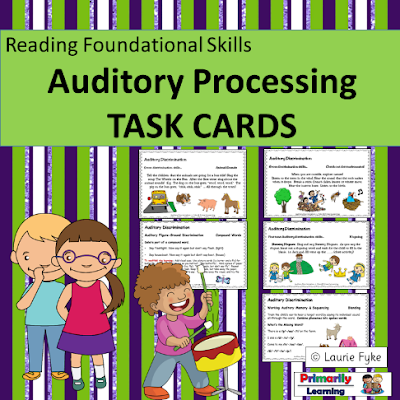 Check out these 30 task cards with activities to develop auditory awareness skills! Try this! Put varying items in recycled small plastic juice bottles that have twist tops. Fill two containers to the same level (e.g. ½ full. ¼ full), with the same item. Hot glue the lids onto the containers. Use a colored marker to place matching dots on the bottom of the two containers that make the same sound. Shake the container to hear different sounds. Shake your container as you sing a familiar song. Try to use the beats of the music. Demonstrate shaking patterns. Ask your child to copy the pattern. e.g. | ♪ ♪ ♪ ♪ | ♪ ♪ ♫ ♪ | ♫ ♫ ♫ ♪ | Use the rhythm of familiar songs. In a classroom, create three groups of children. Hand out similar containers to each group (e.g. containers filled with sand, beans, coins). Create a soundscape as you suggest a rhythm for each group, and then direct the children on when to play. They are following both oral, and visual directions! Find more “at your fingertips” ideas to develop Auditory Awareness, Discrimination, and Memory Skills with these 30 Amazing Task Cards! Please Note: Each child is different, and children develop at varying rates. Your 3 - 5-year-old may be quietly observing the world around or demonstrating determination, and persistence. Some children will quickly grasp, and enjoy an activity, while others need repeated lessons. Some children are bold and daring, while others are shy and cautious. Remember to provide numerous and varied learning opportunities because children do not all learn at the same time, or in the same way. Have fun! CVC Rhyme – Peg It! 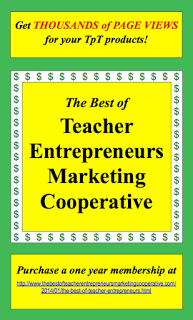 Facebook Great ideas, including recipes, contributed by fellow professionals. 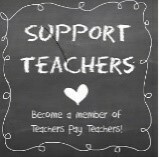 Be sure to click "FOLLOW ME" under the store name, 'PRIMARILY LEARNING' on the 'Teachers Pay Teachers' website to receive notifications of new products and upcoming sales. You may use your PayPal account or PayPal's credit card service. Just say Laurie Fyke at Primarily Learning sent you!